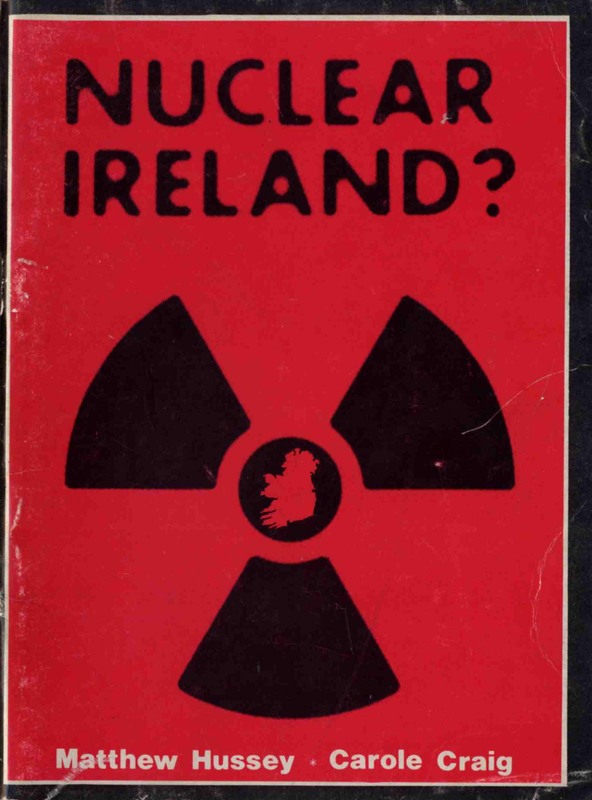 Posted by irishonlineleftarchive in Irish Left Online Document Archive, Miscellaneous. This is a document, and many thanks to Jim Monaghan for forwarding it, that to some extent runs at a tangent to much of the Archive. But it is without question that in the mid to late 1970s campaigns and activism developed that were centered on issues beyond socialism as such or the North and foreshadowed social campaigns and the rise of the environmental movement and its political face in the Ecology Party and later the transition of that organisation to a Green Party. However, that said, the left in all its forms was involved in the campaign to prevent the arrival of commercial nuclear power on our shores. The Fianna Fáil government had produced a Green Paper on energy, ‘Energy-Ireland, Discussion Document on some Current Energy Problems and Options’. Fission energy is safe only if a number of critical devices work as they should, if a number of people in key positions follow all their instructions, if there is no sabotage, no hijacking of the transports, if no reactor fuel processing plant or repository anywhere in the world is situated in a region of riots, or guerilla activity, and no revolution or war – even a ‘conventional one’ – takes place in these regions. The enormous quantities of extremely dangerous materail must not get into the hands of ignorant people or desperadoes. No acts of God can be permitted. Inside it deals with the science of nuclear energy, safety issues, aspects of the econmics of nuclear power and the political ramifications. it also discusses alternatives. Throughout it is illustrated by Martyn Turner cartoons and strips. It’s actually quite a snappy read and very evocative of the period within which it was produced. Odd to reflect that as recently as this last week, John Gormley was arguing that the nuclear option while not his choice was not something that he would dismiss out of hand. On a further tangent to this topic there’s some illuminating material inside the Lost Revolution on the agonising within SFWP on the issue of nuclear technology. Government officials and the public sector unions are expected to begin considering in detail today proposals for reducing the pay bill for next year. The introduction of a compulsory unpaid leave arrangement for staff in the public service next year is emerging as a central feature of any alternative deal between unions and the Government for reducing the public sector pay bill without across-the-board pay cuts. The details of the amount of unpaid leave that staff would be obliged to take next year under any such alternative agreement has not been decided. There has been speculation in recent days that it could involve 12-14 days per year. The introduction of compulsory unpaid leave would effectively represent a reduction in earnings for staff – some unions estimate that it means a 2 per cent cut for every five days of unpaid leave. However, the nominal pensionable pay of workers would remain the same. Or… when is a pay cut… not a pay cut? When it sort of is a pay cut? An enjoyable piece from Karl Whelan over on Irish Economy which takes to task some of the assertions made by Pat McArdle in the Irish Times this week and in particular the notion that there is no connection between the monies pumped into the banks and the budgetary crisis. I like Whelan’s stuff. He’s honest and although not on our side of the ideological divide (last week he had an interesting piece on flat taxes, but… it was on flat taxes) there’s usually something worth reading. If the exchequer were to inject another €4 billion capital into Anglo Irish Bank in the morning, this would increase the EBR by an equivalent amount but would have no impact whatsoever on the GGD. This is because the international rules treat such capitalisation as a “below the line” transaction, i.e. investment in a commercial State body which is outside the government sector, rather than current expenditure which affects the deficit. Whelan disagrees. Not least because Anglo ‘is no longer a commercial operation and the government will get back none of the €4bn that was put in this year, nor is likely to get back what it will put in next year’. It’s funny, I was reading McArdle’s piece on Thursday morning and thinking, hmmmm… that can’t be right – particularly when he started to argue that General Government Deficit was the ‘critical measure’ of fiscal policy rather than the Exchequer Borrowing Requirement, but wasn’t quite certain as to whether it was my own bias that was informing me or something a little bit more grounded. Good to see it wasn’t just me for Whelan dismisses this too. And telling to note that a year ago I probably wouldn’t have recognised that something was slightly amiss. Them’s the times we live in. The €4 billion of “cuts” is required to stabilise the GGD in 2010 at the alarmingly high level of 12 per cent of GDP; without them, the deficit would rise to 14 per cent, the highest in the euro zone. It is unlikely that this would be tolerated by either the markets or the EU. The estimates given in the April budget, namely €4 billion for the scale of the action needed to prevent the 2010 GGD worsening, stand, irrespective of whether or not the banks are bailed out or the pension fund terminated. Unfortunately, there is no easy way out of the current fiscal dilemma; fortunately, this seems now to be increasingly realised inside the Dáil. However, the communication of this message to the public at large remains a challenge. In this case because there is a core of dissenters on one aspect of fiscal policy, that being NAMA, there is an immediate critique, not from the left but the economic right, to point out that his analysis is arguably incorrect and that, as Whelan notes, the capital injected into the banking sector has a direct impact upon the broader budgetary crisis. It is perhaps a sign of how dominant the economic orthodoxy is that it takes IE to provide this critique. Pat McArdle writes economic commentaries for The Irish Times . He is a former chief economist with Ulster Bank. This is the first of a number of pieces he will write between now and budget day, teasing out the options facing the Government and their implications. A continuing series? It looks like we can expect entertaining times ahead. At least on that front. Let’s keep it contemporary for a few more weekends. After all it’s coming up to the end of the year and it’s always good to think ones heard something new. Thing is with The Early Years that true enough. But… A couple of weeks ago I referenced Hallogalloo by Neu! in relation to System 7, last week we saw the Horrors reshaping themselves as a post-punk krautrock act influenced by…er… Neu! and what’s this? Why it’s another, earlier, run-through. And while some might be irritated by that I kind of like the sort of cheek of giving that a lash. It’s enthusiastic indie tinged with krautrock and a rhythm section who know how to get things started and just keep going. Is it new? It sure isn’t, but as with all the best music it sounds new enough. I particularly like their sort of Embrace meets Neu! approach of soft ballads that morph into pulsing noise. And the production on the ballad parts of the songs is crystal clear, something I don’t usually like, but it’s the way it changes that largely makes the songs. Great stuff. Wiki claims that Damo Suzuki likes them and that he invited them to play as his backing band some years back. And somehow I’ll bet both he and they were chuffed by that, albeit for different reasons. It’s funny, 1979 through to 82 were heavily influenced, in post-punk, by Krautrock, and here we are thirty odd years later and the wheel has turned yet again. All Ones And Zeros (an… ahem… homage to Neu!) from their debut album released in 2007. A leaflet from a Waterboys benefit concert for the Green Alliance from 1987. At the same time Red Wedge was running in Britain. The leaflet also advertises a CND demo at the British Embassy to mark the 30th Annniversary of the Windscale Fire. Workers Party Youth from 1991. With the ‘Youth Agenda’ of the time. Joan Collins from the 2004 local elections. and not quite of the Left…. Posted by leftopenhistoryteam in Irish Left Open History Project, Socialist Party of Ireland (1971-1982). As a means of opening the discussion on the SPI the accompanying document was donated by Mark P (for which many thanks and many thanks also to the SP for allowing us access to some documents from their archive) and seems entirely suitable for the Open History Project. It provides a report by the Socialist Party of Ireland (not related to the contemporary Socialist Party) on their 1973 National Congress. The SPI was a split from Official Sinn Féin which took place in 1971 with a small cadre believing that the larger group was overly exercised by the national question and insufficiently Marxist-Leninist. The SPI never achieved national prominence, but in adopting some positions not dissimilar to BICO (and working with BICO) it foreshadowed developments in the WP later in the day (and some of its members returned to OSF and later the WP). But the party ultimately merged in 1982 with some from BICO and Jim Kemmy’s Limerick group as the Democratic Socialist Party. Internal unease at the perceived primacy of nationalist politics over social agitation resulted in several Dublin activists resigning from Sinn Féin in the aftermath of the 1971 Ard Fheis. Among those who left to set up the Socialist Party of Ireland (SPI) were former leading figures in the Dublin Housing Action Committee. most were also OIRA members who had already left following disputes over the movement’s political direction that surrounded the 1970 IRA General Army Convention. In order to help fund the new party, SPI supporters robbed £1,000 from a post office in Ballymun. Despite some allegations of intimidation, relations between SPI members and their former comrades remained relatively good, with several rejoining Sinn Féin within a few months. The new group would eventually adopt a view on the ‘national question’ strongly influenced by the British and Irish Communist Organisation’s ‘two-nations’ theory. It was openly pro-Soviet and unashamedly adopted Communist iconography. But outside of Ballymun, where it campaigned consistently on local issues, the SPI failed to make a discernable impact and never numbered much more than a few dozen activists. The Lost Revolution doesn’t expand on the dispute at the Army Convention and that is a matter which would be worth exploring further. The Socialist Party of Ireland (SPI) (Cumann Sóisialachais na Éireann in Irish) was a minor left-wing political party which existed in Ireland from 1971 to 1980. The SPI was set up by ex-members of “official” Sinn Féin. It was formed on 13 December 1971 in Dublin and published its political manifesto on 19 January 1972. The SPI saw itself as a hard-line Marxist-Leninist alternative to the Communist Party of Ireland, which it criticised for its “blurred philosophy, loose structure, of discipline and unity”. The SPI opposed the friendly stance taken by the CPI towards official Sinn Féin, which it saw as a “mixture of petit-bourgeois radicals, nationalists and ultra leftists”. The SPI supported the Communist Party of the Soviet Union and the Moscow Declaration of 1969. 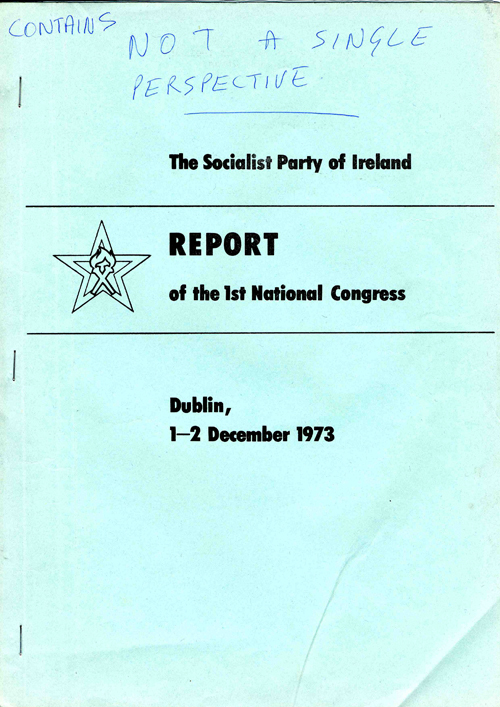 It staged its first national congress in Dublin on 1–2 December 1973. The congress elected a seven member central committee comprising of Fergus Brogan, Desmond Hughes, Deirdre Uí Bhrógáin, Éamonn Ó Fearghail, Seamus Ó Reachtagáin, Fergus Quinlan, and Séamas Ó Brógáin. In the late 1970s, the party started discussions with several other groups with a similar policy on the National Question, including the British and Irish Communist Organisation (B&ICO) and the Limerick Socialists headed by Jim Kemmy. Eventually the three groups merged forming the Democratic Socialist Party (DSP) with one elected representative in the Dáil (Parliament). The DSP eventually merged with the Irish Labour Party which became a junior partner in a coalition government. During its life, the SPI was very active in campaigning for divorce (Divorce Action Group), contraception (Contraception Action Campaign), abortion (Right to Choose) and, in particular, opposition to nationalism and the campaign of the Provisional IRA (Socialists Against Nationalism). It supported the Two States Theory which accepted the right of the Unionist population of Northern Ireland to remain part of the United Kingdom until such time as a majority of the population choose otherwise by democratic means. The party’s head office was at 23 Parliament Street, Dublin 2. In 1976, it renamed itself the “Socialist Party”. Several SPI members ran as independents in Irish elections, the most successful being Eamonn O’Brien from Ballymun, whose performance in achieving over six percent of the vote in the Dublin County North constituency in the 1977 General Election, encouraged Official Sinn Féin on the parliamentary road. He also joined the Workers Party and later the Labour Party and represented ballymun as a city councilor. The party’s publications, Vanguard and Advance, set a new standard for left-wing publications, using modern layout and photographs in a high quality reproduction format. On 1 December 1982, the Socialist Party dissolved itself into the Democratic Socialist Party. That concentration on an activist approach to issues such as divorce and contraception is also of great interest for it foreshadowed a shift towards such issues by the left more generally during the 1980s. Clearly whoever wrote that had access to the Report of the 1st National Congress. The Report itself neatly lays out the SPI line on a matter of topics, particularly in the opening speech from the Congress. Of considerable concern was the EEC, joined that year, the FG/Labour coalition, ‘preparations’ for a move away from neutrality, national wage agreements. This is couched in a language of direct confrontation with the state and the ‘treachery’ of the trade union movement. On the North the party was clear that only by ‘bringing to the fore […] class issues’ could the situation be resolved and that it was certain ‘that campaigns of bombing and counter-bombing, murder and assassinations, produce only negative results which serve the interests of imperialism’. On international relations the party welcomed ‘the constructive foreign policy of the Soviet Union [which] has made the greatest contribution to the establishment of an enduring peace based on mutual respect for sovereignty of states and non-interference by states in each other’s internal affairs. The Soviet/Federal Republic of Germany treaty has ended the cold war. The Soviet-American agreements make peaceful co-existence between the two great powers into a principle of state law’. It also lamented the overthrow of Allende in Chile. We must refer to the existence of the organisation called the ‘Communist Party of Ireland’, because it is as a direct consequence of its failure that two parties exist claiming revolutionary leadership of the Irish working class. We must make it clear that our difference with the CPI is not just on their attitude to the national question. The truth is that the CPI lacks not just one but many – one might almost say all – of the characteristics of a communist party: and the logical and inevitable result of its vague philosophy, its loose structure and its lack of discipline and unity is its imminent collapse into opposing factions, which points to the absolute necessity for a new organisation. And yet, a most intriguing one at that whose influence on certain aspects of Irish political life may have been greater than their numbers. It’s hard at this remove to understand the trajectory of their development from more orthodox than the CPI to the DSP. More information gratefully accepted. Addendum by WBS: I knew quite a few people in the WP who had been through the SPI, indeed the first time I heard about the SPI was probably in 84 in the party club having a pint at a table up against the street side surrounded by old-timers who looking back were probably barely out of their twenties but at the time seemed like wisdom incarnate. There was no question that even though they’d left and the party had disbanded at that stage they still had good memories of it, almost as if it were a rite of passage. Worth drawing attention to the annotations in the text of the document above by a later, rather more critical reader. 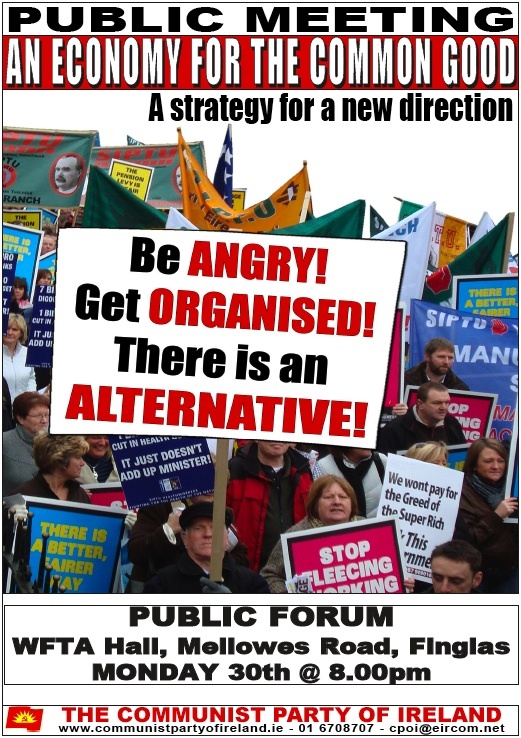 Posted by WorldbyStorm in Irish Politics, Social History, Social Policy, Society. We live in a state where significant elements of its apparatus, including most crucially those elements charged with security and oversight of such matters colluded (with some honorable exceptions) with Church authorities in covering up a range of acts which are difficult to credit both in their scale and severity. The Church itself up to its highest authorities are shown to have known about this abuse across decades and been unwilling to deal with it on any serious level until societal mores changed sufficiently and its power was diminished sufficiently for temporal authorities to take charge. The volume of revelations of child sexual abuse by clergy over the past 35 years or so has been described by a Church source as a “tsunami” of sexual abuse.2 He went on to describe the “tsunami” as “an earthquake deep beneath the surface hidden from view”. The clear implication of that statement is that the Church, in common with the general public, was somehow taken by surprise by the volume of the revelations. Officials of the Archdiocese of Dublin and other Church authorities have repeatedly claimed to have been, prior to the late 1990s, on „a learning curve‟ in relation to the matter. Having completed its investigation, the Commission does not accept the truth of such claims and assertions. The Dublin Archdiocese‟s pre-occupations in dealing with cases of child sexual abuse, at least until the mid 1990s, were the maintenance of secrecy, the avoidance of scandal, the protection of the reputation of the Church, and the preservation of its assets. All other considerations, including the welfare of children and justice for victims, were subordinated to these priorities. The Archdiocese did not implement its own canon law rules and did its best to avoid any application of the law of the State. The authorities in the Archdiocese of Dublin and the religious orders who were dealing with complaints of child sexual abuse were all very well educated people. Many had qualifications in canon law and quite a few also had qualifications in civil law. This makes their claims of ignorance very difficult to accept. Child sexual abuse did not start in the 20th century. Since time immemorial it has been a “delict” under canon law, a sin in ordinary religious terms and a crime in the law of the State. Ignorance of the law is not a defence under the law of the State. It is difficult for the Commission to accept that ignorance of either the canon law or the civil law can be a defence for officials of the Church. Another consequence of the obsessive concern with secrecy and the avoidance of scandal was the failure of successive Archbishops and bishops to report complaints to the Gardaí prior to 1996. The Archbishops, bishops and other officials cannot claim that they did not know that child sexual abuse was a crime. As citizens of the State, they have the same obligations as all other citizens to uphold the law and report serious crimes to the authorities. 1.92 There were a number of inappropriate contacts between the Gardaí and the Archdiocese. Clearly the handing over of the Fr Edmondus* case to Archbishop McQuaid by Commissioner Costigan was totally inappropriate. The relationship between some senior Gardaí and some priests and bishops was also inappropriate – in particular, in the Fr Carney and Fr cases. 1.93 A number of very senior members of the Gardaí, including the Commissioner in 1960, clearly regarded priests as being outside their remit. There are some examples of Gardaí actually reporting complaints to the Archdiocese instead of investigating them. It is fortunate that some junior members of the force did not take the same view. 1.97 As is described in Chapter 6, the health authorities have a very minor role in dealing with child sexual abuse by non family members. The Commission is concerned that the legislation governing the role of the HSE is inadequate even for that limited role. There is a need to clarify exactly what the role of the HSE is in relation to non family abusers and to set out clearly the powers it has to implement that role. The HSE and the health boards have given the impression to Church authorities and the Gardaí that they can do more in the area than they actually have the power to do. 1.99 The Commission notes that there was an extraordinary delay in introducing child protection legislation. The need for new legislation was clearly recognised in the early 1970s but it was not actually passed until 1991 and not fully implemented until 1996. That new legislation, the Child Care Act 1991, does not sufficiently clarify the powers and duties of the health authorities. The primary responsibility for child protection must rest with the State. In enforcing child protection rules and practices, organisations such as the Church cannot be equal partners with the state institutions such as the Gardaí and health authorities. The Church can certainly work in co-operation with the State authorities in promoting child welfare and protection as, for example, the sports bodies do, but it must be remembered that it is not an agency with equal standing. 1.101 Such communications as took place between the Archdiocese and the Gardaí prior to 1995 were largely inappropriate. Since the implementation of the Framework Document, the Archdiocese and other Church authorities report complaints of clerical child sexual abuse to the Gardaí – this is appropriate communication. 1.103 The vast majority of those who were abused as children complained when they were adults. In almost all cases they said that they did not complain as children because they did not think they would be believed or because the abuser had told them not to tell anyone. It is striking that, of the relatively small number who complained at the time, the majority were in fact believed. They were believed by their parents and they were believed by the authorities to whom the abuse was reported. This makes the failure by the authorities all the more egregious. 112 were made in the 2000s (mainly between January 2000 and 1 May 2004) and there were 10 suspicions/concerns. I genuinely believe every citizen of this state, and those on this island, should be reading this which is available here. As yet a further catalogue of the failures of the state and more widely the society it is essential if we are not to repeat them and as a means of validating those who at the very point where they needed the trust and security of the state were let down by it. Three European-level political have seats in the new Commission: the EPP (of which Fine Gael is a member), ALDE (of which, more recently, Fianna Fáil has become a member) and the renamed S&D, of which Labour is a member. The distribution of seats is not good for the Left. Although S&D won twice as many seats as the ALDE in the European Parliament elections last June (184 for S&D to 84 for ALDE), they have fewer seats in the new Commission: 6 out of the 27 for the S&D against 8 for the ALDE. With only a third of the members coming from the S&D, the next Commission is not going to be good for those of us on the Left.